Great news!!! Part 2 of the May edition of the SNR is now available. To say that this is filled to the brim with some amasing stuff would be the understatement of the year. Just look at what some of the readers had to say already. Not only will you be treated to some great tutorials (some by yours truly..LOL), Kate our brilliant Editor-in-Chief has written a fantastically entertaining and educational article called the introduction of gels, mediums and paste which is an absolute must read. Not only does she have a great sense of humour but she single handedly takes the scary out of mixed media for those scrapbooking artist wanting to make the plunge but may still be too nervous and unsure. The best part is that this is only the beginning of the series. Personally, I can't wait for the next instalment. 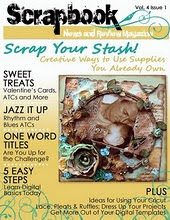 If you haven't subscribed yet, then best you sign up now because not only will you be treated to all of the above but you'll have access to all the other fantastic tutorials and primers from the last 3 months, not to mention all the great inspirational pieces in the scrapbooking, cards, digital and mixed media sections. Wow that is quite the list, it all looks very very interesting, thanks for sharing the info.will have to go take a peak.